You can use the steel plate RONDO pedestal ashtray to equip indoor and outdoor smoking areas. Since the sieve and ashtray insert can be removed, emptying is easy and fast. 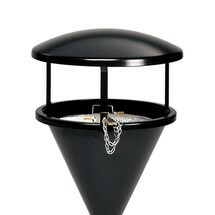 The VAR® CLASSIC pedestal ashtray, plastic, is impact-resistant and weather-resistant and is suitable for outdoor use. 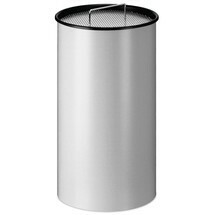 The pedestal ashtray has a galvanised sieve and is available in different colours. The VAR® stainless steel ashtray is a weather-resistant, large-volume ashtray with canopy. 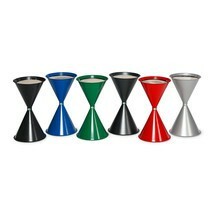 It can be mounted on walls or used as a pedestal ashtray with a base. The VAR® ashtray, stainless steel has a canopy and a snuff plate for cigarettes. 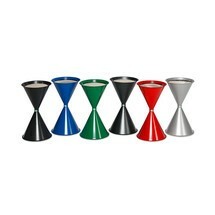 The ashtray is easy to clean and available in different versions. 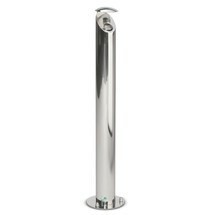 The VAR® CLASSIC pedestal ashtray, stainless steel is particularly robust and durable. The ashtray has an insert for sand reduction and a removable sieve. The colour can be chosen in the steel version. Sieve and ashtray insert of the pedestal ashtray for outdoor use can be removed. 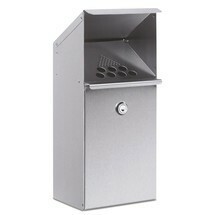 This enables you to dispose of the cigarette butts quickly and easily. The VAR® pedestal ashtray, stainless steel, with roof, which is made of powder-coated steel plate, is suitable for indoor and outdoor use. The pedestal ashtray has a secure footing and can be anchored to the floor. The weather-resistant ashtray with canopy is available with 1 or 2 separate inner liners. The delivery includes lock and base plate. The VAR® roof prevents any rain or snow getting into the ash container. The roof is supplied with a steel anti-theft lock. The VAR® quartz silver sand for pedestal ashtrays prevents cigarette stubs and embers from igniting. You can use an optionally available sieve to easily clean the quartz silver sand which can then be reused several times.